After last week's defeat to England, Ireland faced a tough prospect at Murrayfield in the first kick off of this weekend's Six Nations schedule. 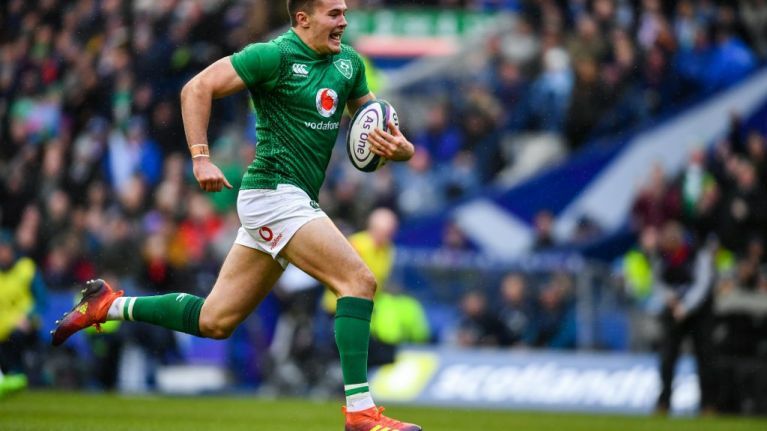 After that, a beautiful move that saw the ball change hands between Irish players in the middle saw Jacob Stockdale surge through and leave the Scotland forwards in his wake as he ran beneath the posts. Johnny Sexton, who missed an easy kick early on, was replaced by Joey Carberry after a prolonged blood substitution. But it was a game of two halves for Carberry. Early in the second half, the replacement fly-half broke through the Scotland line and threw a huge, looping pass and found Keith Earls who widened the gap. Carberry stepped up again shortly afterwards to convert a penalty, leaving Ireland 22-13 up. While Ireland kept the pressure on for the final 20 minutes, a fourth try and bonus point remained elusive — but this performance will definitely help put last week's memories behind them, and leave Ireland feeling confident about the World Cup repeat of the fixture.